Midway through her first-round match at the Australian Open this year, world No. 10 CoCo Vandeweghe refused to return to the court until someone brought her a banana. “I’m waiting for the banana. How are they not on court? I mean, c’mon, that’s not my fault,” Vandeweghe told chair umpire Fergus Murphy. “Let’s play!” an annoyed Murphy said into his microphone, clearly fed up with Vandeweghe. “No, you don’t have time now,” Murphy warned, but a defiant Vandeweghe had already started eating one of the bananas. Vandeweghe was roundly mocked in the press for holding up the match this way. “CoCo goes bananas,” read one ESPN headline. People couldn’t understand how a professional tennis player could become so invested in a single banana. But this wasn’t the first time this had happened. After a second-round match at the 1998 Rome Masters, Félix Mantilla was so pissed off at Thomas Muster that he refused to shake his hand. The reason? Earlier during a changeover, Muster had run up to Mantilla, snatched the banana from his hands, and eaten it. At the 2006 U.S. Open, Maria Sharapova was accused of receiving illegal coaching after her father started waving a banana at her from the stands, apparently trying remind her to eat banana. “I believe, at the end of the day, personally, my life is not about a banana,” Sharapova told reporters after she won the final. If only this were true. The lives of professional tennis players are very much about bananas. They’re the most popular snack on tour, and tennis players consume more of them than maybe any other pro athlete. “All tennis players eat like five bananas a day,” Eugenie Bouchard told the Sunday Express last year at Wimbledon, where tens of thousands of the fruit are consumed every tournament. “It’s almost like a ritual,” the ATP’s head nutritionist Page Love told me. If you want proof of the enduring popularity of the banana in tennis, talk to Love about her attempts to convince tour pros to try any other kind of snack other than bananas. Love doesn’t think bananas are the best on-court snack, and often recommends that players try some of the carb-heavier, saltier foods in the basket, like pretzels and energy bars. But most players stubbornly refuse to let go of their bananas. Love isn’t the first person to question the suitability of the banana as an on-court snack. 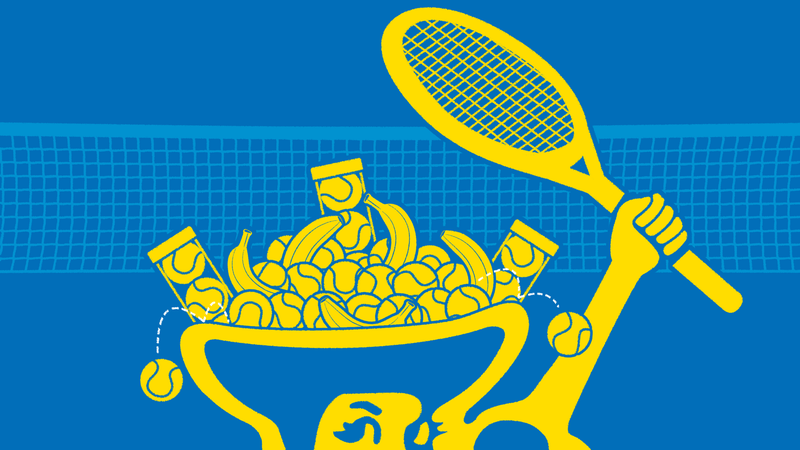 In fact, up until recently, the banana wasn’t a popular tennis snack at all. Just a few decades ago, the idea of eating a banana on court during a professional tennis match wasn’t just unpopular: It was laughable. Haas told me he started telling players to carry bananas around in their bags in the ‘70s, when he realized that they were the perfect on-court snack. Why the banana, of all the foods? Haas ran the program on a computer at Florida State University, feeding it nutritional data in the hopes that it would yield the perfect on-court snack. “I started looking for ideal combinations of nutrients for athletes, like magnesium, potassium and choline,” he said. “Only one food out of all the things that I searched came up with a pretty good ratio of nutrients, and that was the banana. Haas said that many people laughed at him when he pitched his nutritional advice to pros in the ‘70s. “When I first started trying to tell people about [bananas] and sports nutrition in general, none of them would listen. Everything I was doing was being mocked at the time. The banana began kind of like that. As like, an outcast. If at this point you’re confused about which parts of banana nutrition are backed by actual science and which parts aren’t, you’re not alone. One reason why some coaches and nutritionists today try to steer tennis players away from bananas is because they believe the sugars in bananas aren’t taken up by the body quickly enough during exercise to result in any kind of energy boost. Love herself told me something to this effect. The problem with this is that a lot of the science around the uptake of sugars during exercise is sponsored by Gatorade, which wants to convince us that drinking “quick carbs” like maltodextrin or dextrose (of which you can buy a 50-pound bag for 60 bucks here) is good. In the resulting thicket of sugar drink-sponsored and -influenced research, it’s hard to determine which sugar sources are actually good or bad. Here, finally, was definitive proof of the banana’s efficacy as an on-court snack. The missing piece in the banana nutrition puzzle. “Yes, hi. I have you on speaker,” Nieman told me when I called him to talk about his banana study. Admittedly, finding out that this study was sponsored by the Dole Food Company initially felt like a bit of a setback. “I think the future of sports nutrition is figuring out what these fruit molecules do for the athletes,” Nieman said at one point in the conversation. How reliable could research about fruit backed by the world’s largest fruit company really be? But the more I thought about it, the more all of this began to feel like a huge opportunity. Who better to take on Gatorade than Big Banana? Absolute scientific fact. This was huge news. I immediately got in touch with Xavier Roussel, VP of Marketing at Dole, to discuss potential ways Dole could move forward with me and Gillit’s proposal. Roussel was a bit less enthusiastic about the idea of getting into sports endorsements than Gillit. He explained that because retailers mainly compete on price when it comes to fruits and vegetables, produce companies generally have much thinner margins than consumer packaged goods (CPGs) like Gatorade, which means less money for big splashy marketing expenses like athlete endorsements. “Having said that, you know, there are a bunch of athletes out there that would probably align on health and nutrition and natural foods, we would have no issues aligning with them,” Roussel told me. What kinds of athletes are we talking here? So if we’re going to compete against Gatorade, we’re going to need to endorse someone big? Someone with high visibility? Roussel was right—bananas are a product that everyone enjoys. But it felt like we were beating around the bush a little bit here. So I asked him point-blank: could Dole ever compete with Gatorade in the sports fuel market, head-on? Roussel might not think that fruit and veg needs to be more “contentious,” but I do. I am confident that banana companies like Dole have what it takes to launch a muscular consumer packaged goods (CPG)-style marketing campaign positioning bananas as a direct competitor to Gatorade. Nick Zarzycki is a writer living in Toronto. Would You Eat A Peeled Banana That Other People Touched?